One of the highly effective yet seldom recognized signs that a city is on the right “path” toward walkability and a person-friendly downtown is the urban pathway. These pedestrian-only, artistically manicured alternatives to walking on a noisy sidewalk alongside busy streets serve several constructive purposes when building a vibrant downtown. Often pedestrians and cyclists are faced with the following choices… walking “the long way” around a city block just to get to a destination in between two streets a block away, or possibly cutting through an unattractive and at times unsafe city parking lot. An urban pathway will typically bisect a city block in between two streets, essentially cutting the block in half for pedestrians. Cars can take the long way around while you shoot through on foot to your destination. Typically, these pathways take pedestrians away from busy car-filled streets and on to a much more peaceful, walking experience. We don’t always realize how important comfort is to building walkable city neighborhoods. Urban pathways provide a safe, comfortable “experiential” environment for walkers, which is vital to the creation of a walking culture. Often these walkways employ creative concrete, stone or brick designs, grasses, trees and plant life, benches and even small art installations. 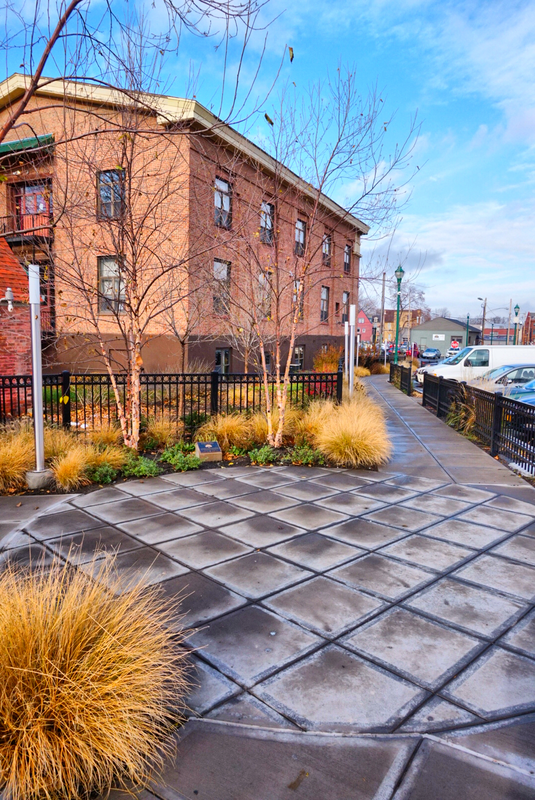 Aside from providing a safe and functional accessibility amenity, urban pathways can be micro-parks that add a visual vibrancy to any urban setting. Cities all over the country are talking a lot about the creation of pedestrian friendly streets. And a lot of it is just that… talk. The creation and maintenance of these urban pathways is a clear signal to residents that walkability is a priority worth investing in. What would you rather do, take the long way around the block, cut through a parking lot, or stroll down a path that’s made for your enjoyment as you walk? Which of the above would encourage you to walk your city more often? Urban pathways are red carpets for city-goers who wish to have a connection to their downtowns and neighborhoods, and because of this, these creative, walkable paradises are here to stay!